With a suite of printers within the 30,000sq m factory, Leach can now manufacture both indoor and outdoor graphics, solutions ideal for both warmer and colder climates, reusable products, as well as graphics for technologically challenging shapes, structures and specifications. 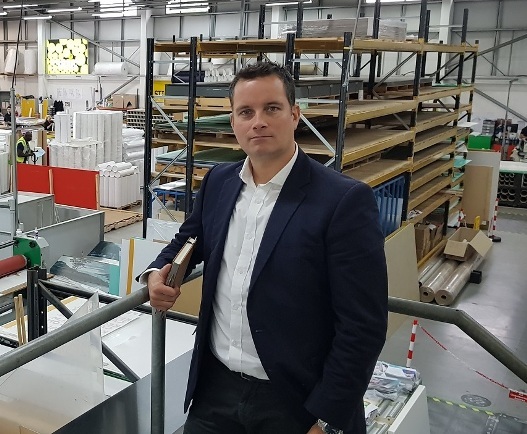 Leach’s managing director James Lavin said: “As demand from the retail, exhibition and heritage sectors continues to rise, we are passionate about being able to help more clients, as quickly as we can, without any detriment to quality. James added: “We had to be certain of the run rate and quality, and the only way to truly verify this was to see the Durst Rhotex 325 – and its rivals – in action. We were not disappointed. “This is a dual-purpose system which can alternate between direct-to-textile and transfer printing, meaning maximum flexibility for our busy team moving forwards. When the printer and sublimating technology arrived at our Huddersfield HQ, it took a full week to install and configure, but we were ready to accommodate the machine without any disruption.